Video transcript summary on key symptoms of Lyme Disease and some diagnostic options. Note, this is only for Lyme, if there are co-infections the 4-week cycle may be hard to distinguish due to symptoms from other pathogens which don’t follow a 4-week cycle. One of the classic signs that you have Lyme is that the symptoms come and go. They also move around the body. For a while you’ve got bad headaches, those go away and your feel good for a while. Then suddenly you have migrating joint pains; your elbow, then it’s your knee, etc. Different symptoms come and go because of the biology of the spirochete. It has a growth cycle that’s based on about four weeks. There will be an active phase of the borrelia with a lot of symptoms, and by the way, that antibiotics are effective. If it’s going into a more dormant phase they don’t work, and you’ll feel better. There’s a cycle that’s pretty predictable, of four weeks. Its’ recommended that Lyme patients, and even if you suspect you have this, and it wasn’t diagnosed, you keep an actual calendar that’s marked off in the little squares to make it easy to look at. You just record your good days and your bad days. Maybe with color coding. Blue for good, red for bad. Then jot down the main symptoms you’re experiencing. If you notice there’s a dominant pattern about four weeks long (it could be six), that’s one of the clinical signs this is Lyme. Another one is low grade fevers in the afternoon. Lyme tends to be more active in the afternoon. When it first comes on it tends to mimic the flu. You’ll feel achy, headachy, kind of feverish, exhausted. 2:45 – As far as the testing goes there’s testing for C4a with normal C3a and in the database and in the database, it explains what that is. (the video shows some definitions). There should be a positive for borrelia direct tests and there’s a PCR (see the database), these are different types of tests to positively identify the borrelia. Even if it didn’t come through on the Western Blot, you can take these other tests. The antigen is the Western Blot type. 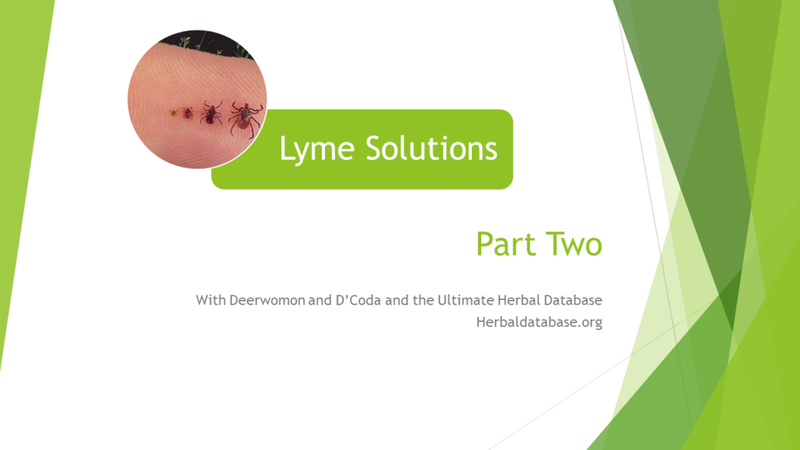 3:23 – A culture is the most specific test, where they take a tissue sample and culture it to find out exactly what kind of borrelia you have because the main one is Borrelia burgdorferi, and that’s the one they’re looking for in Lyme. However, there are about 100 species and they’re finding more of them all the time. Some produce disease more than others. New species have cropped up producing disease symptoms that are a little bit different. 4:05 – Screenshots showing more information about Borrelia burdorferi. We can read more about what doctors …and I’ve gone with the doctors who’ve done the most research with the most patients, successfully, for what I’ve included in the database. 4:25 – This is an example of using a natural protocol called the Byron White Formulas. 4:33 – Deerwomon; I was actually taking some notes, because I also have wanted to get back-up testing, and as I listen to you describe Lyme disease, just for the audience, not very long ago I was diagnosed with the Rocky Mountain Fever. But as you’re describing these symptoms I’m wondering if perhaps my diagnosis wasn’t accurate. 5:05 – D’Coda; That’s quite possible. This is what’s so frustrating to doctors and patients. I would suggest you spend some time in the database and read up on this because I’ve made an effort to help people with their own diagnosis, working with the doctor. Hopefully you have an open-minded doctor that’s willing to work with you. This is tough for them too. Tell your doctor about the database.